On September 30, 2011, celebrated defense intellectual Zhang Zhaozhong [ 张召忠 ] visited the small but important and growing Sino-North Korean border city of Dandong, giving a talk about China’s national defense. Zhang, described by the trustworthy JustRecently blog as a bit of a hard-liner prone to suspicion against US-Japan-South Korea military alliance, got a good look at China’s frontier defenses, such as they are, on that section of the border with North Korea. The news item about the professor’s visit was rather brief, but it does indicate Dandong’s growing importance in the Chinese security landscape, something which I wrote about back in February 2011 when border forces there were beefing up. Dandong’s military committee heads spent a few days bucking up their ideological bona fides last month in Tibet in yet another example of cadre in frontier zones learning from one another about how to repress popular revolts and intimidate (or otherwise seduce, we can hope) neighbor states. Around the same time, Dandong was reshuffling its high-tech bureaucracy to bring more talent to the city in an effort through an organization called “Friends of the Yalu River.” The Xinchengqu project is rather immense, and it is largely about high-tech machinery. Borrowing selectively from the large light- and high-tech industry hub in Shenyang, Dandong seems poised in a few years to flood (if you will forgive the sloppy and contextually inappropriate metaphor) North Korea with microchips and intricate electronic devices. After lavishing unprecedentedly sycophantic praises for China’s October 1 National Day, KCNA, the North Korean news agency, comes out and asserts that Korean civilization, with its epicenter in Pyongyang, is older than Chinese. Pyongyang, October 6 (KCNA) — An event took place before King Tangun’s mausoleum on Monday to commemorate the Foundation Day of Korea. The memorial service for Tangun, ancestral father of the Korean nation and founder of Ancient Korea, the first state in the East, takes place annually before the mausoleum. Tangun had been known as a myth but he was confirmed as a real human being when his remains were discovered in Kangdong County, Pyongyang, in Juche 82 (1993). He was born in Pyongyang 5011 (±267) years ago as of 1993. Succeeding to his father as patriarch, Tangun gradually revamped the primitive structure into a ruling tool for controlling confrontation among classes and tribes. He then founded Ancient Korea in the area with Pyongyang as the centre in the early 30th century B.C. Ancient Korea became a strong country after conquering small neighboring countries and expanding its territory. Under the rule of Tangun, the Korean nation put an end to the primitive ages and entered the age of statehood and civilization, developing into a homogeneous nation. This goes to prove that Ancient Korea was founded in the almost same period with ancient states in the Nile River basin and Mesopotamian region, known as birthplaces of human civilization, and earlier than those in the Indus River basin and Hwang Ho basin. Tangun was confirmed as the ancestral father of the 5 000-year-old Korean nation under the wise guidance of President Kim Il Sung and leader Kim Jong Il. If you think this kind of assertion doesn’t rankle Chinese scholars and leaders, spend an afternoon with me sometime soon in the PRC Foreign Ministry Archive, and I will show you how, during a very friendly 1962 visit by Liu Shaoqi to Pyongyang, an obscure North Korean journal threw the Chinese into a minor fit by asserting that Korea had never submitted to the Mongols (in other words, had thrown off for a period of a couple hundred years the Chinese tributary system). Calling one’s country the oldest brother in East Asia is a particular right that China likes very much to reserve for itself. On the other side of the ledger, Chinese regime-media approved bloggers posted a bunch of photos of life in the North Korean countryside and concluded that Chinese poverty cannot even begin to compare of that in the DPRK, once again rendering North Korea into an entertaining and momentary spectacle that allows good Chinese to recall how much better their own lives have become since, say, 1976. Lower-level functionaries celebrated the 100th anniversary of the Xinhai Revolution of 1911 in Pyongyang last month, marking the emergence of a No. 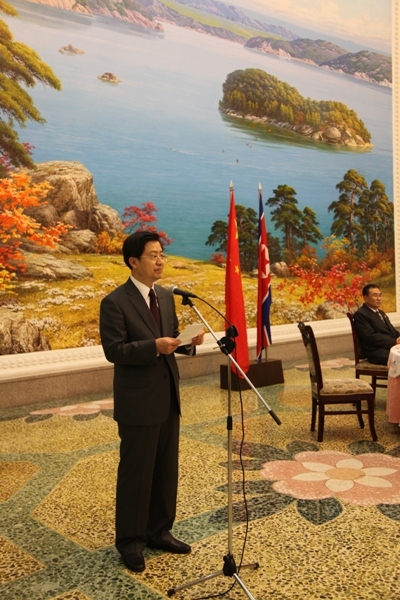 2 figure in the PRC embassy there named Guan Huabing [关华兵], pictured here with North Korean colleagues in the DPRK-China Friendship Association. At least 80 Chinese students and language teachers are living in Pyongyang, working and learning at institutes like Kim Chaek University of Technology. When they party at the Embassy and try out their basketball moves in a 3-on-3 tournament (damn you, David Stern!) it doesn’t appear that they are allowed to bring North Korean friends along. More importantly, it appears that the visit of Prime Minister Choi to China and Nanjing appears not to have yielded any kind of breakthrough or consolidation of ideals and projects previously agreed to. And Choi brought a rather large delegation with him, certainly the largest I have seen in recent times. In a minor sign that all is not necessarily going smoothly, Wen Jiabao opened his remarks at that meeting with a nod to “knotty areas (错综复杂的地区)” which might be taken as a nod to island zones or the local environment. I think the concept of Korea being “older than China” doesn’t look like a real challenge to Chinese academia anymore – their own ways of cooking history books may not express self-confidence, but they will probably look at North Korea as a somewhat whimsical neighbor by now. This latest beauty contest may keep the fenqings busy, though. But it could indeed signal a deterioration in the cordial atmosphere between the two sides. Not for me to judge – my info about Beijing-Pyongyang relations isn’t up to date -, but North Korea wouldn’t be the only ally who’d signal that Beijing “needs to do better”. Myanmar has just shelved a joint hydropower project with Beijing. The main reason for China’s “patience” with their spoilt little (or elder-little) brother seems to be that they are somewhat afraid of the bomb on the other side of the border, of a swell in the flow of refugees – and that they don’t take this challenger too serious. Just wondering what would happen if France claimed to be “older than China”. Btw, thanks for the link. It’s probably the first one in months from any other blog. Thanks for the comment, JR. I also hadn’t realized the Myanmar dam had a China connection; only that it had elicited protests from a nascent “civil society” there — which leads me to think a moment about popular responses to Chinese economic (regional hegemony in the borderlands) strength and that the response of North Korean lao bai xing are never guaranteed to be positive. If reports of the DPRK as absorbing tons and tons of Chinese electronics waste/pollution are at all accurate (to my knowledge, I’ve never seen a truck or trainload of the stuff go into North Korea), then something similar might be forecast in the North. “The vehicle assembly factory of the Phyongun Jungsong Joint-Venture Company started operation. Built by the Capital City Passenger Traffic Guidance Bureau of the DPRK and the Dandong China-DPRK Frontier Trade Company, Ltd. of China, the factory is another revelation of the daily-developing friendly and cooperative relations between the two countries. Great find; thanks, Gag! I suppose that if South Korea wanted another reason to be nervous about Chinese inroads into the DPRK, this — in an area of undisputed ROK production and export strength, no less — could be one. I doubt that the Phyongun Jungsong Joint-Venture Company is going to give anyone in Seoul sleepless nights, since China seems to be dominating the minuscule DPRK automotive market anyway. Since the Capital City Passenger Traffic Guidance Bureau is involved, perhaps the real purpose of the joint venture is to put at least a token number of new locally-built (sort-of) buses on Pyongyang streets in time for the Great Leader’s centenary bash next year. For propaganda purposes, it would be good for foreign vistors to see and, better still, travel in plenty of new vehicles made “by our own efforts” to help give them the impression that the DPRK is becoming a “strong and prosperous nation”. Good point, Gag, about imports into DPRK. The fiasco a couple of years back about clearing the roads of Japanese-built cars has yet another consequence. Your point on 2012 preparations also makes plenty of sense, another civic reward for the virtuous Pyongyang elites (along with big living rooms and, presumably, hot water 24 hours a day). I’m feeling stronger and more prosperous already. I was going past Sajik Park (a little west of Gyeongbok Palace) in Seoul on 개천절 (10/3) when an impressively loud speaker system coming from within the park caught my attention. I went to go see what it was all about and found a large stage with a huge image of Tangun as a backdrop and with an table/altar in front of it like you see at solemn occasions like funerals here. One of the speakers even very solemnly bowed deeply three times to the image before approaching the podium. The speakers read proclamations all starting out with “In the year 4344 Tangun…” or somesuch. I wasn’t 100% sure of what came after but it all seemed like a bunch of high-minded, er, vacuous “spirit of brotherhood / Koreanhood” — not that there would be anything wrong with that in and of itself but that there was something lurking beneath the niceties. And sure enough, when I opened the program, there were two photos of the same event from last year — one in Seoul and one in Pyongyang. I later showed the program to a coworker and he said this indeed was a Pyongyang-sympathizer event. They certainly had some money, with lots of tents and the big stage, etc., but it was a pretty small gathering of older folks for the most part. Fascinating — thank you, DanB, I have no idea how I missed this at the time. Many, many belated thanks!